When everyone is baking pumpkin pie, we are here posting an apple pie recipe? Oh yes we are. 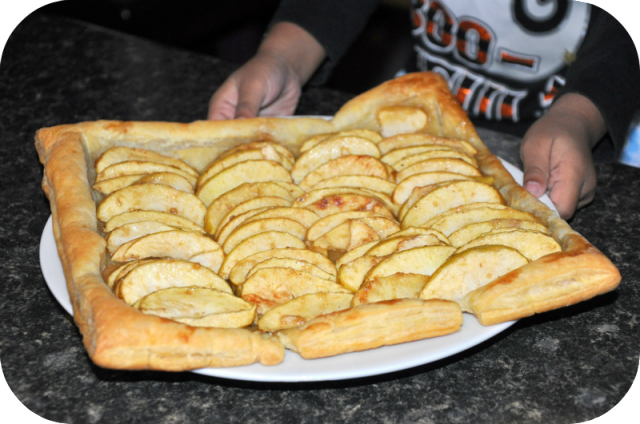 The family went apple picking and hence we are here with a good apple recipe – apple tart pie. Fall brings many things: cold weather, vivid colors, festivities, pumpkins, apple and some wonderful apple desserts. Apple picking with the kids has become a family tradition. It is a great way for daddy to bond with his girls while connecting with nature. They try to reach the highest branch and pick the biggest apples. When we get back home mommy of course has the endless options of baking apple pie, apple tart or apple tart pie or any other apple dessert. Even before we started to pick, the first thing on my husband’s mind- When are you planning to make the pie? Almost immediately Big S echoes in on it – I want to make the pie ! Let us make it today. After a long day of apple picking, I’m too tired to make a pie-dough from scratch and and spend hours on peeling and cutting apples. But I also have a pie-loving man and a pie-maker to please. Call this a Pie or a Tart or an apple tart pie. Here is a short cut that is so easy and works for my family, it will satisfy a pie-craving hunger ! Do you see where I am going with this? It’s a pie filling on a tart. You can use all or use up what you have on hand to flavor. You really cannot go wrong with it. The only caution is, do not let the mixture become watery. If it is runny add some more flour to thicken. 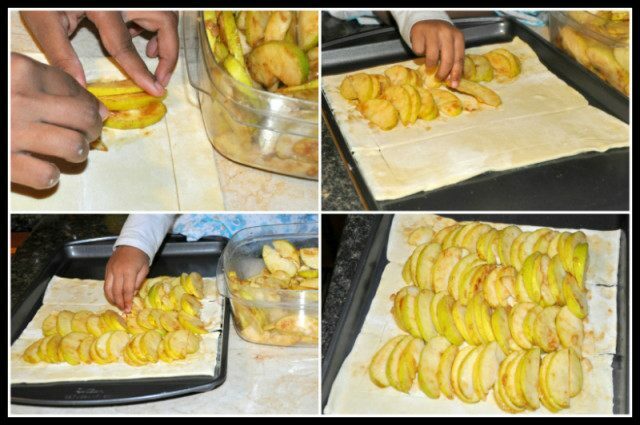 Better yet, this is such a kid friendly recipe and something they can be involved from start to finish. What can be better than that? Having your kids in the kitchen doesn’t have to be a daunting task if we agree upon the rules and make the task more fun by involving them in a few steps. I have broken down the process into easy steps for your convenience. Cut the apples and put them in a bowl. 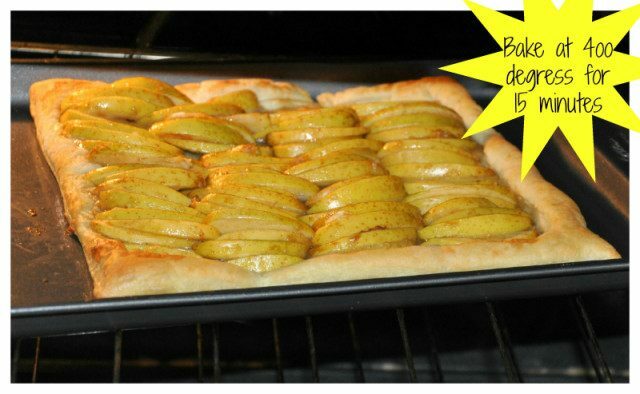 Squeeze the lemon juice over it ( to avoid browning) and add all the ingredients except the puff pastry, of-course ! Mix them, gently enough not to break the apples. Roll out the puff pastry and draw a border along the edges . Arrange the slices onto the pastry sheet leaving an edge ( this is where the border helps). Big S loves arranging the apples in a line and sure enough does a fine job of nestling them closer. Let it cool just enough to handle, serve warm as is or with ice cream or whipped cream ! Hope you give it a try and get your kids involved. Remember to discuss rules and make memories in the kitchen with your kids. Ok..”making memories” is not THAT much of a corny phrase. Hello Visitor, Thanks for stopping by our little space here. We encourage you to stick around and take a look at couple of our popular posts. Looks Yum. I’ll have to try this, too! Thanks Danielle. You can even stuff them in crescent rolls for an easy turnover ! Yumm ! This looks great and something that I really want to try. I get fresh fruit and vegetables from local farms every week and I have a lot of apples! I will likely use my own crust though. Thanks!